December 16, 2017 Molly G.
I love Christmas. So does the cat. The Herdman kids lie, and steal, and smoke cigars (even the girls). They also talk dirty, cuss their teachers, and take the name of the Lord in vain. The last place anyone expects to see them is church. No one is prepared when the Herdmans storm Sunday school and take over the annual Christmas pageant. Before anyone can stop them, they’re plotting revenge on Herod, and burping the baby Jesus. They’ve got the whole town up in arms. How the Herdmans turn a series of disasters I to what everyone agrees is the best Christmas pageant ever, is a hilarious, touching, and unforgettable tale from a beloved storyteller. And the Advent books by Arnold Ytreeide are also really good! There are four in total. This is the first one we read. Talk to y’all later, and Merry Christmas! WOAH!!! I LOVE how big that Christmas tree is! JOTHAM”S JOURNEY!!! That was one of my favorite Christmas book! Mom did a read aloud to us kids a few years ago and I loved it! Glad to see that someone else thought it was cool! Thanks so much, Anna and Malachi! 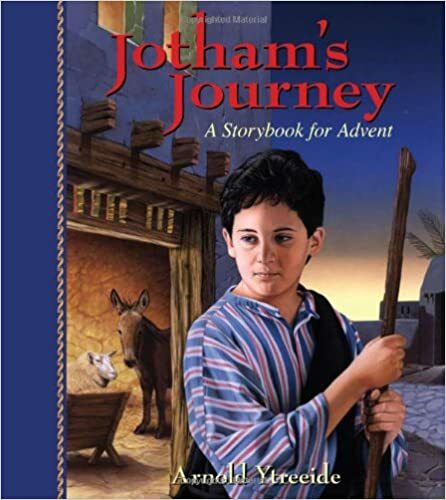 We are reading through Jotham’s Journey again this year. It’s so much fun! My family LOVES Jotham’s Journey and all of the other ones that follow. We actually read that one this year! We’re still working through it. But we have read it before, so not quite so much suspense!